Just past Loudon Park Cemetery's 1970s-era offices on Wilkens Avenue, there are hundreds of acres steeped in Baltimore's 19th-century history. 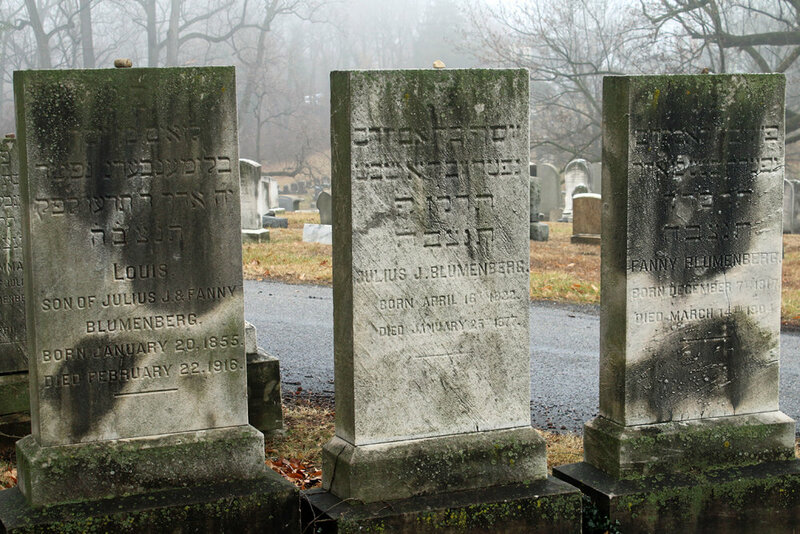 Despite more modern first impressions, the cemetery dates to 1853 when a group of Baltimore businessmen, led by James S. Primrose, established Loudon Park Cemetery on James Carey's former country estate. The cemetery's original and more historic entrance is located on Frederick Road and is now gated. Names on Loudon Park's gravestones include some of Baltimore's most celebrated over the years: Mary Pickersgill, H.L. Mencken, Jerome Bonaparte and, somewhat more recently, sportscaster Charlie Eckman. The once-gossiped-about "Gypsy Queen" (and distant relative of Francis Scot Key) Jesse Key Habersham is at rest with her young daughter. Harry Gilmore, a daring Confederate cavalry officer who oversaw infamous war raids in Baltimore and Harford counties and who later served as Baltimore City Police Commissioner, is there as well. 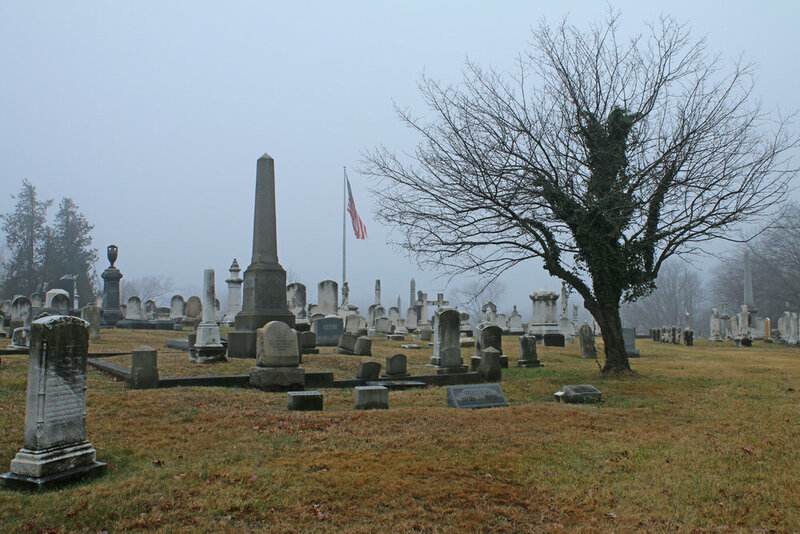 As part of a Civil War border state, Baltimore buried family members on both sides of the conflict: there are 2300 Union soldiers and 650 Confederate soldiers now finally at eternal peace within Loudon Park and its specially-designated National Cemetery. Loudon Park's founders faced competition from Green Mount Cemetery, the first privately-held cemetery in Baltimore and located about eight miles away. To draw potential customers in their direction, they added special amenities for bereaved families. You'll see some remnants of these (as well as a few others added in later decades) as you wind past the offices and into the grounds. 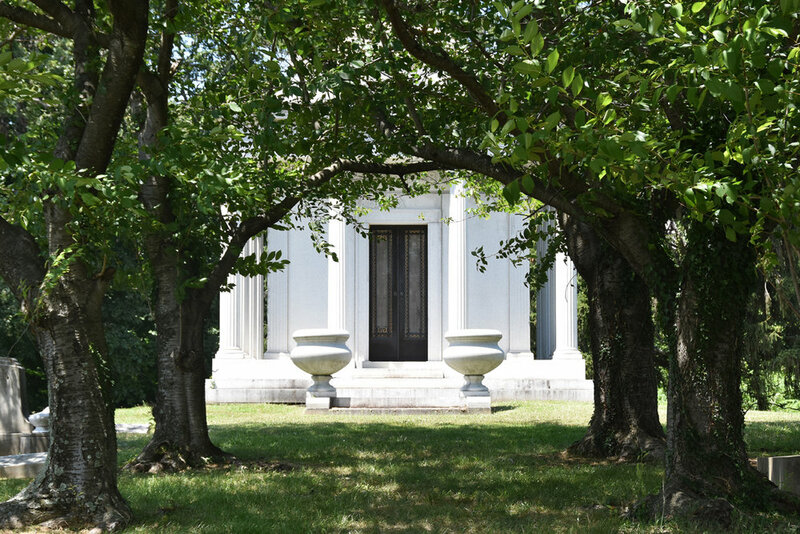 The Loudon Park Mausoleum: In the western area of the cemetery, a grey stone façade, built into a hillside, looks like a chapel and is marked with the word “mausoleum.” In fact, it is neither. The structure, now dreary and deserted, actually functioned as a storage vault. The solid native rock behind the double doors provided the cool temperatures needed to store caskets while family members selected plots or made burial arrangements. The Loudon Bell: Funeral processions and florist wagons announced their arrival at the Frederick Road gate by ringing a 350-pound bell, originally hung in a large tree. The bell’s tolls echoed throughout the cemetery. Gravediggers, each assigned a different number, counted the rings and responded when his number matched the rings. The tree was struck by lightning in 1960. The Loudon Bell was out of use until it was restored in 1972 and hung on a permanent frame. The Loudon Bell was manufactured by McShane Bell Foundry, which still operates today in Glen Burnie. 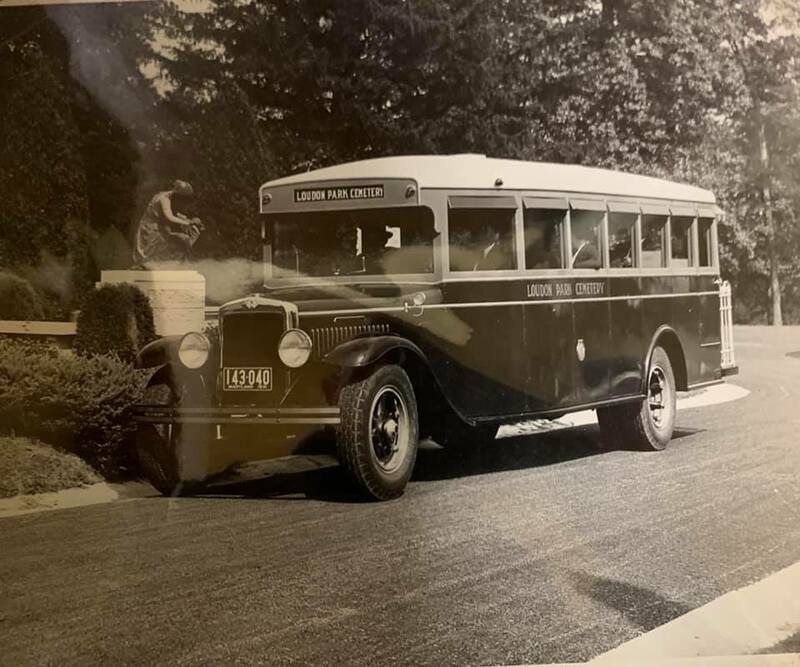 The Loudon Park Trolley: Loudon Park is thought to be the only cemetery in the world that transported visitors and the deceased inside its gates with its own trolley system. Until the trolley began operation with a trial run on November 14, 1905, horse-drawn hearses transported caskets to gravesites. Caskets arrived by way of the Pennsylvania Railroad at the Loudon Station stop, located on the cemetery’s eastern boundary. Frequently, however, they arrived in grander style. The Baltimore City trolley system, operated by the United Railways and Electric Company, arranged for a special funeral car named Delores (the Spanish word for sorrows) to stop at the corner nearest the bereaved family’s home. The deceased rode Delores in a zinc-lined casket, displayed to onlookers through a plate-glass door. Floral tributes, laying on top of the casket, were also visible. Up to eight Immediate family members sat in a compartment of carved mahogany. Additional passengers were accommodated in a passenger section of twelve leather upholstered seats. Windows were etched with frosted drapes, though black shades could be drawn for privacy. The funeral party climbed aboard; often a band walked ahead playing a funeral march. The trolley arrived by way of Frederick Road just feet away from Loudon Park’s entrance. Mourners walked behind the horse-drawn hearse to the burial site. This sometimes-long walk was the impetus behind the establishment of the internal trolley line. Delores operated until about 1923, when motorized hearses and a preference for simpler funerals came into vogue. Over the years, much of the additional land in Loudon Park was acquired from the Primrose Family whose Beechwood, Pleasant Grove and Linden estates surrounded the original cemetery. Generations of the Primrose Family have remained involved in the operation of Loudon Park. 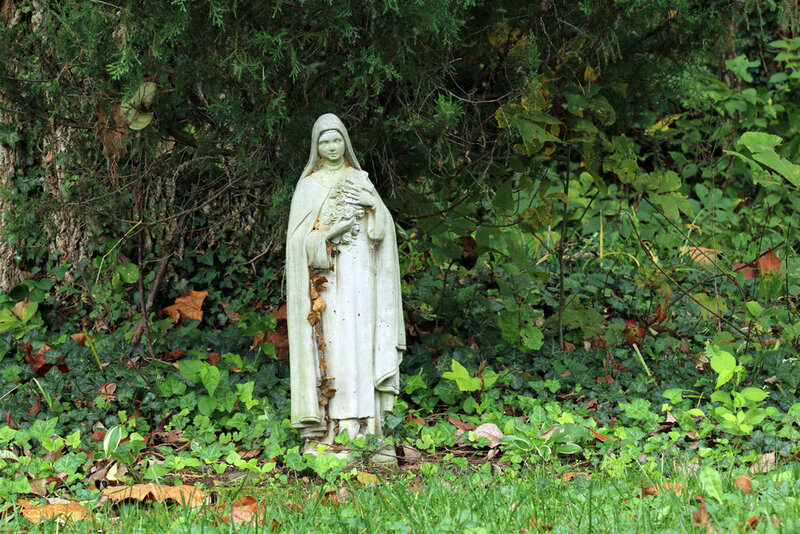 At close to 500 acres with 26 miles of avenues, Loudon Park Cemetery is one of the few wide-open green spaces left in west Baltimore. The original 100 acres came from Loudon Farms, the country home of James Carey, a prosperous shipping company owner. James Carey went on to play an important role in Baltimore history. 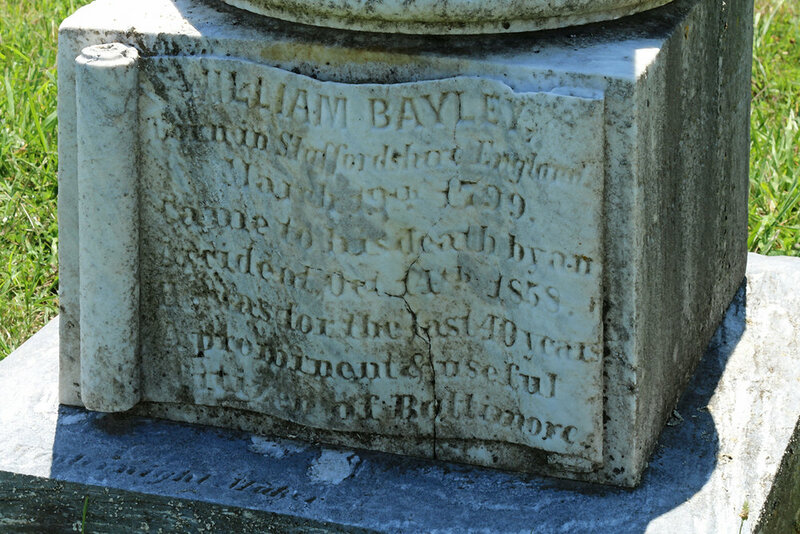 He helped organize and became president of the Bank of Maryland. He was also known for his advocacy for voting rights and for improving the quality of life for Baltimore’s African American residents. Today’s Carey Street is named for him.